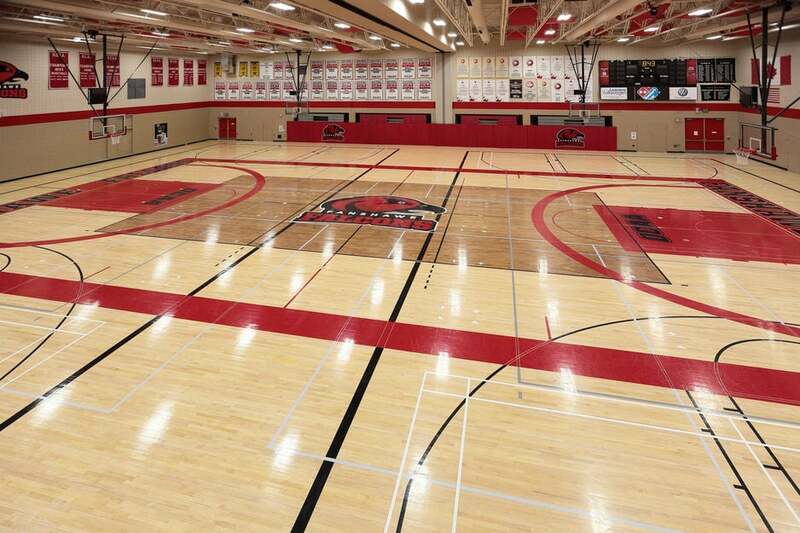 Gym flooring / court resurfacing project at Fanshawe College in London Ontario. Gym hardwood floor sanding, staining and refinishing - resurfacing to rival the big leagues with masking and painting game line markings and custom graphic artwork logos, wordmarks, mascot incorporated into the gym floor finish - Fanshawe College Falcons mascot logo in the centre of the basketball court. A green turf flooring installation / hardwood flooring / wood stairs installation at a Fit4Less gym in Ontario. 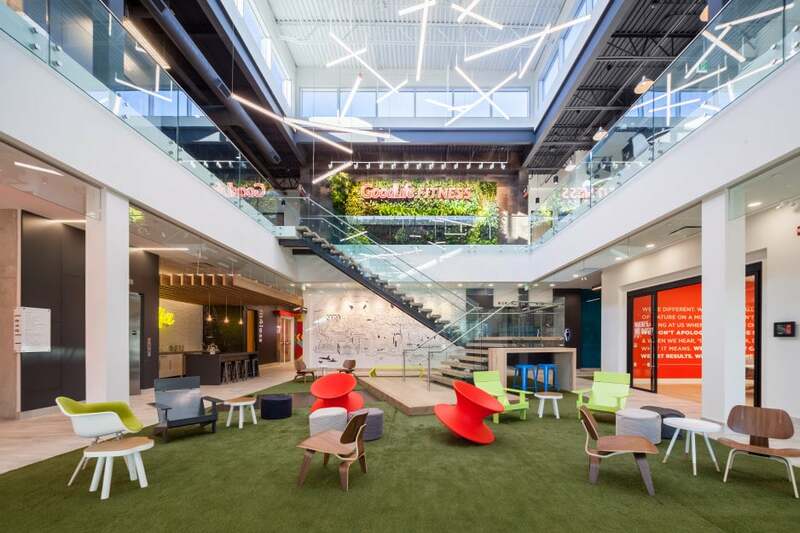 Spacious bright open space, huge high skylight, green turf, grey hardwood stairs, lounge chairs etc..
Gym flooring installation in Toronto Ontario. 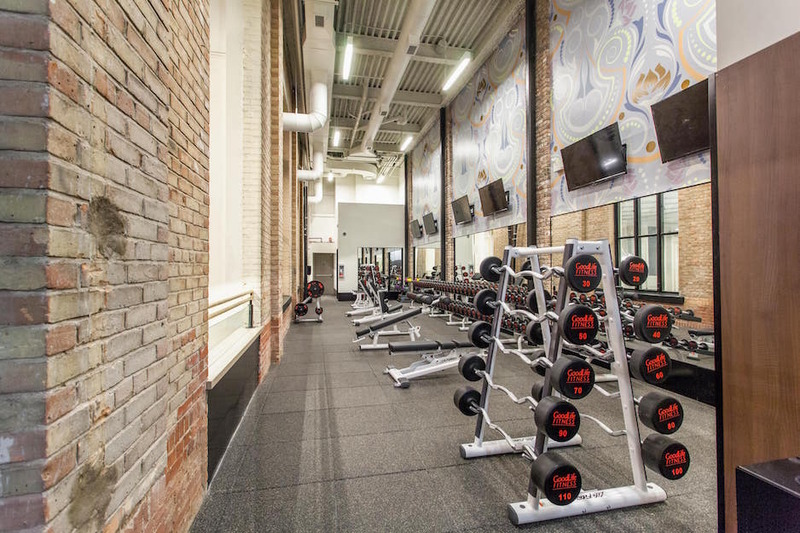 Goodlife gym weight and dumbbell room with rubber flooring, brick walls, and flat screen televisions. 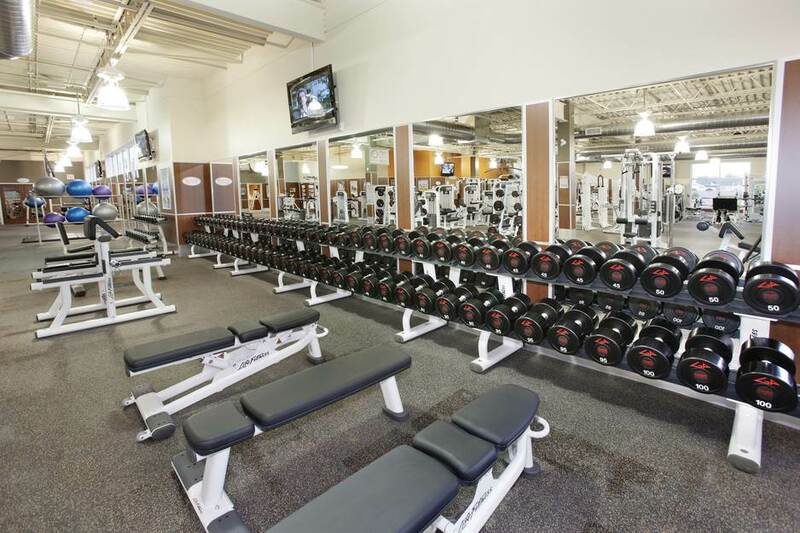 A gym / fitness flooring project in a Markham Ontario, Toronto. 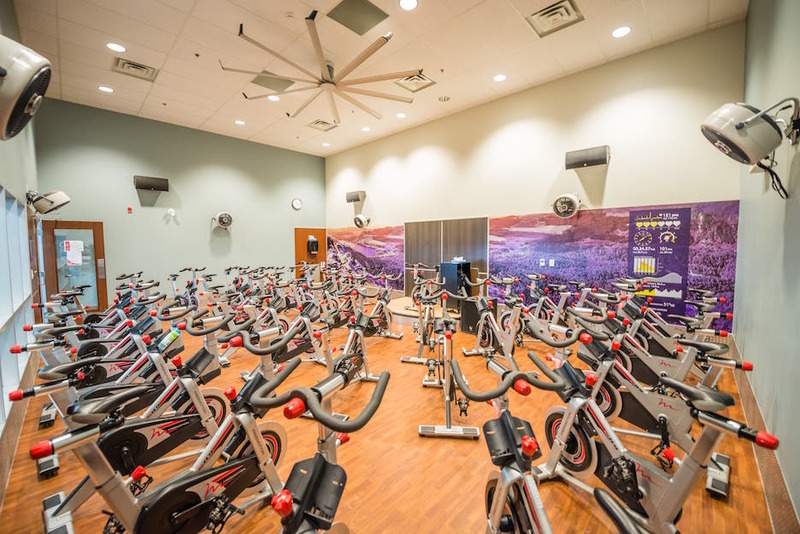 A Goodlife gym cycling room with medium-dark hardwood flooring or LVT (luxury vinyl tile). A sports rubber floor installation in a London Goodlife Gym. A gym workout machine room with rubber flooring and wooden panel columns. 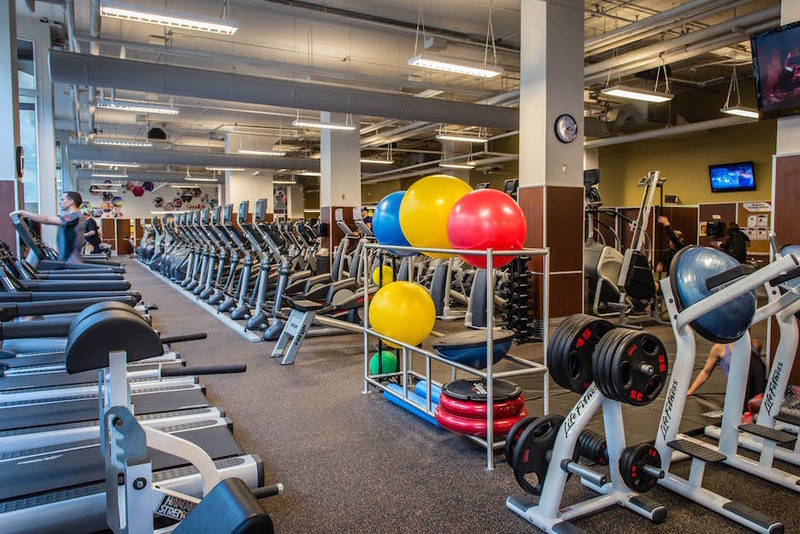 A gym floor / gym flooring installation project in Toronto. 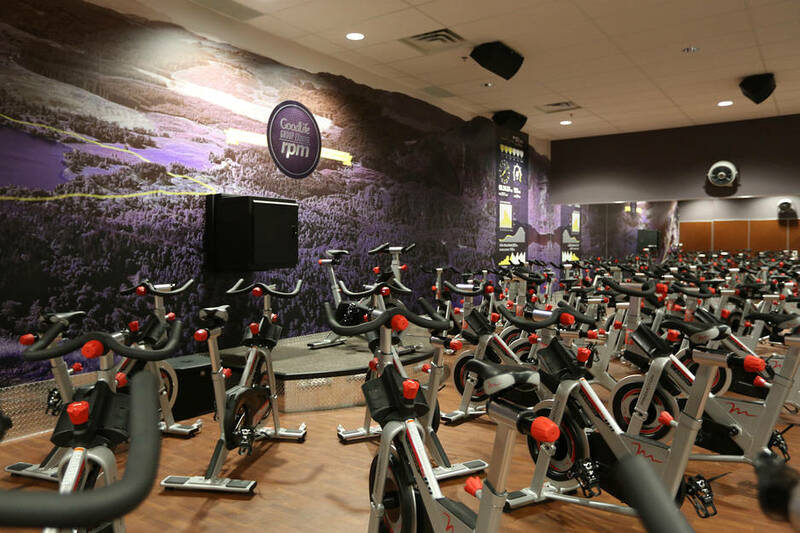 A Goodlife gym cycling room with hardwood or LVT flooring and purple mural on main wall. 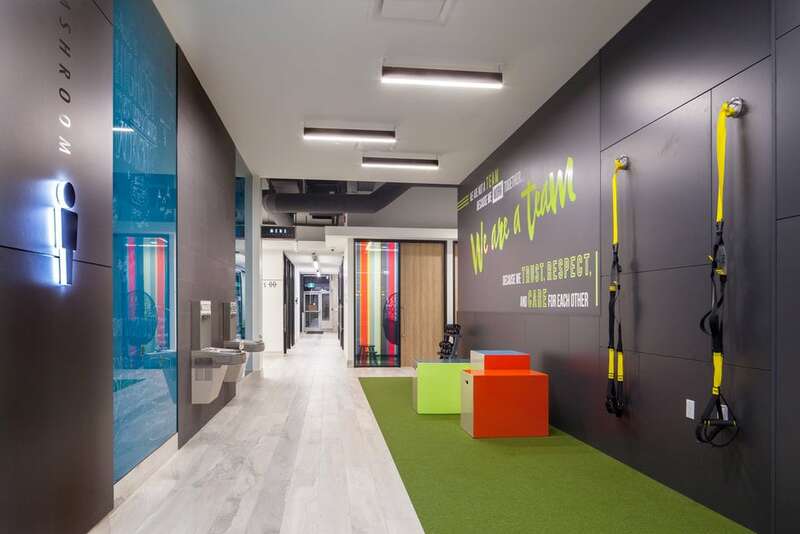 A green turf flooring installation / hardwood flooring installation at a fitness gym offices in Ontario. Green turf, grey hardwood, TRX Suspension Trainers, water fountains. 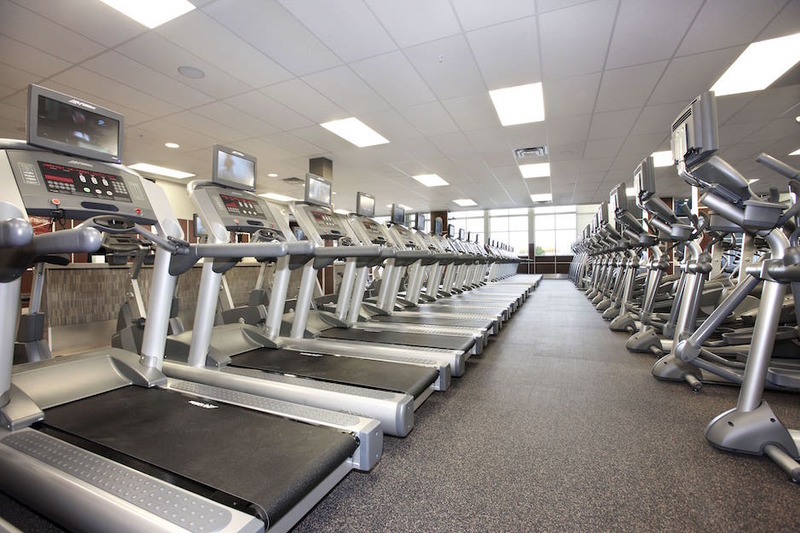 A gym flooring installation in Toronto or London. 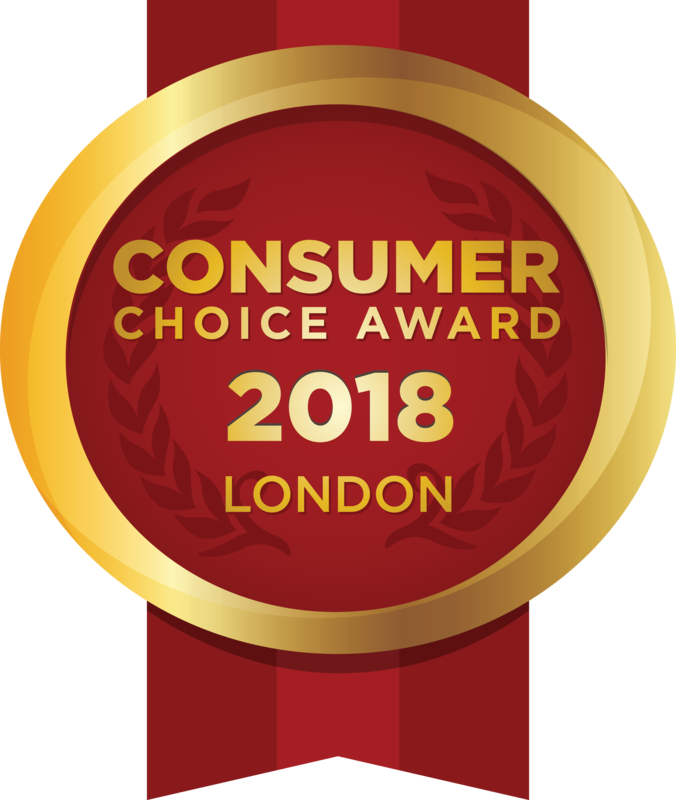 Goodlife spinning classroom with dark hardwood floors or wooden-look LVT (luxury vinyl tile) floors and a large landscape route map on the back wall. Hardwood look luxury vinyl tile flooring project in a BMO Goodlife gym. Hardwood look LVT (luxury vinyl tile) seen from balcony overlooking cardio room. A gym flooring installation project. 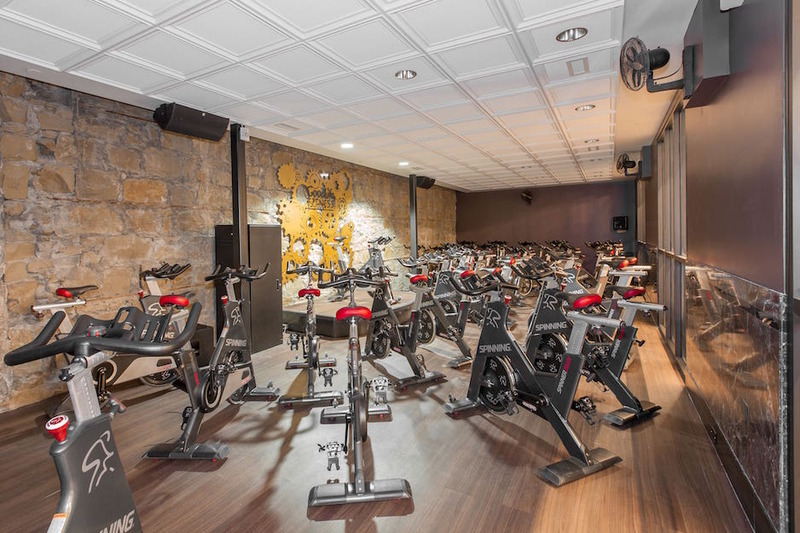 Goodlife gym cycling room with medium dark hardwood floors or LVT (luxury vinyl tile) and stone walls. 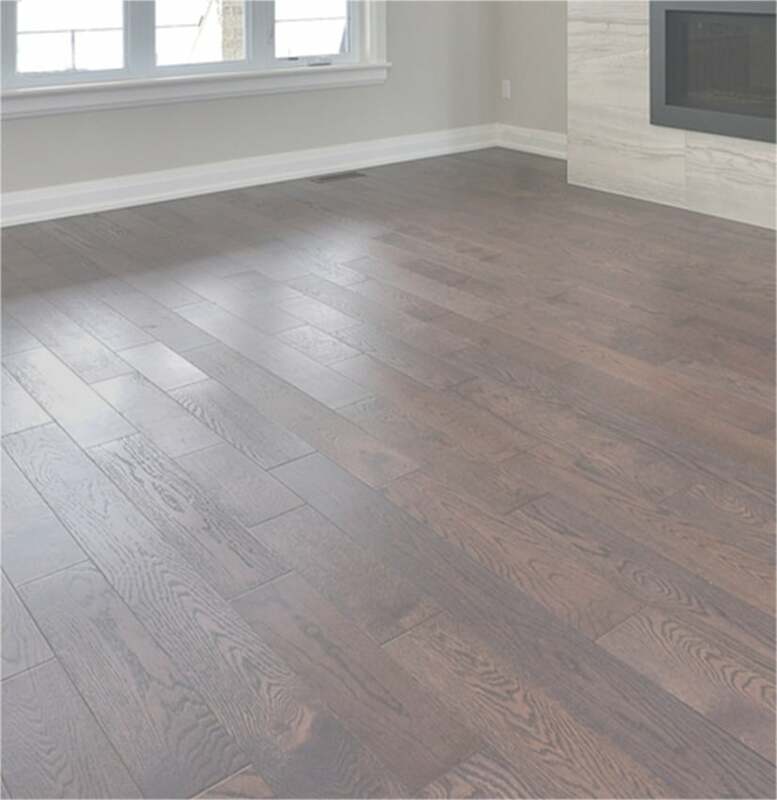 A flooring installation project in Ontario. 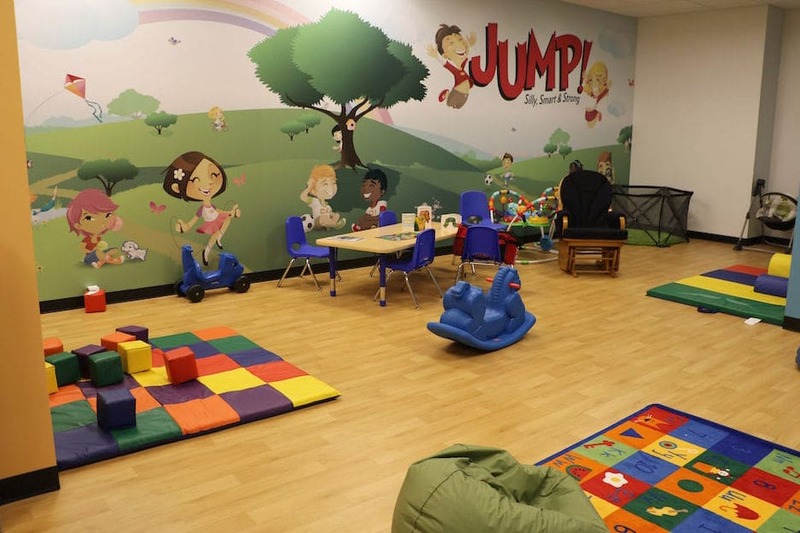 Kids daycare room with natural light-coloured hardwood floors or hardwood looking LVT (luxury vinyl tile) floors and painted mural on the wall. 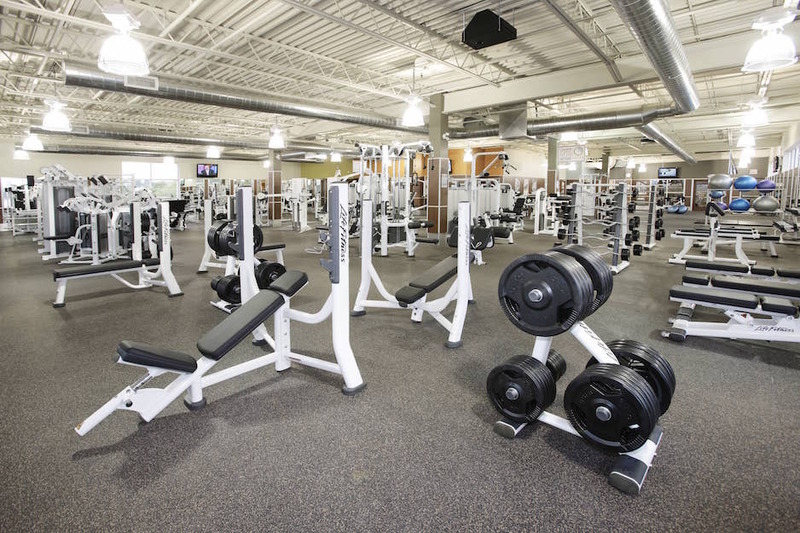 Gym flooring / rubber flooring installation in Ontario. Large Goodlife gym cardio room with rubber flooring. 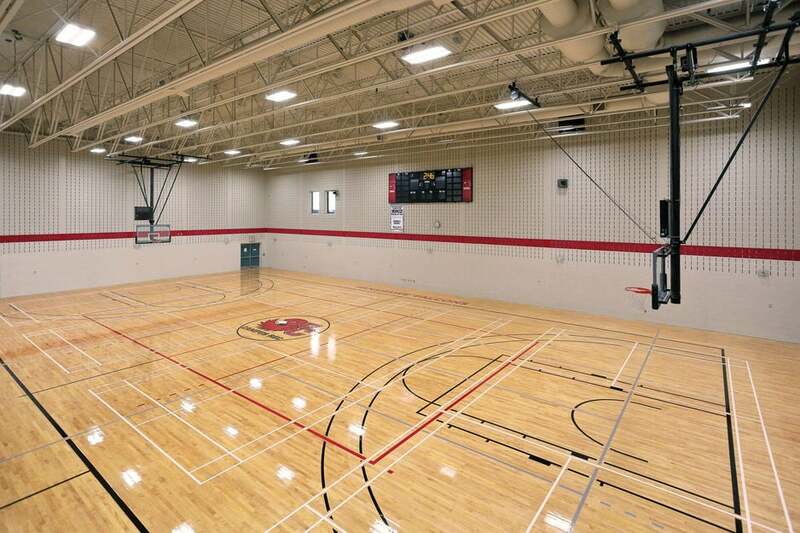 Gym flooring / court resurfacing project at Fanshawe College in London Ontario. Basketball court / gym hardwood floor sanding, staining and refinishing to rival the big leagues with masking and painting services for game line markings and custom graphic artwork logos, wordmarks, mascot incorporated into the gym floor finish - Fanshawe College Falcons mascot logo in the centre of the basketball court. 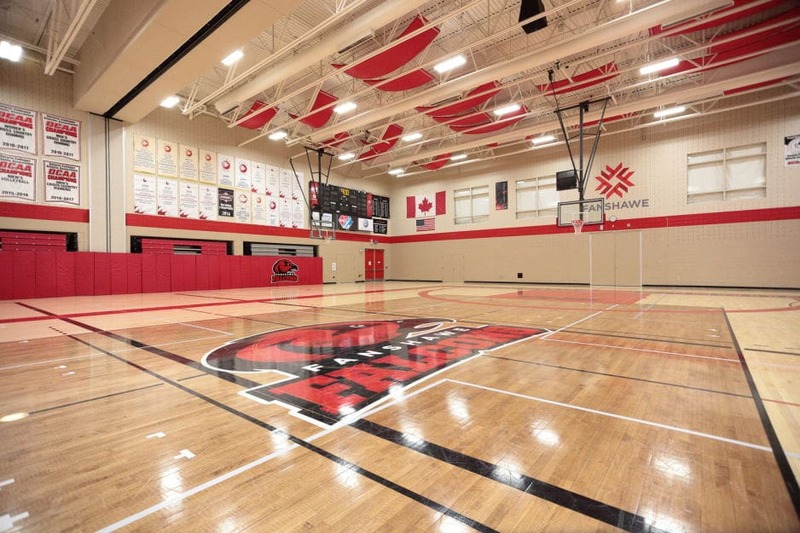 Gym flooring / court refinishing project at Fanshawe College in London Ontario. 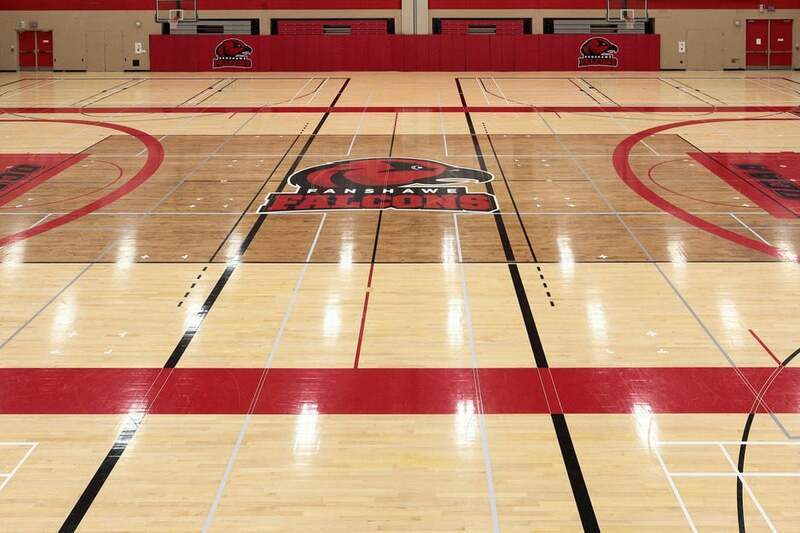 Gym hardwood floor resurfacing, sanding, staining and refinishing, to rival the big leagues with masking and painting game line markings and custom graphic artwork logos, wordmarks, mascot incorporated into the gym floor finish - Fanshawe College Falcons mascot logo in the centre. 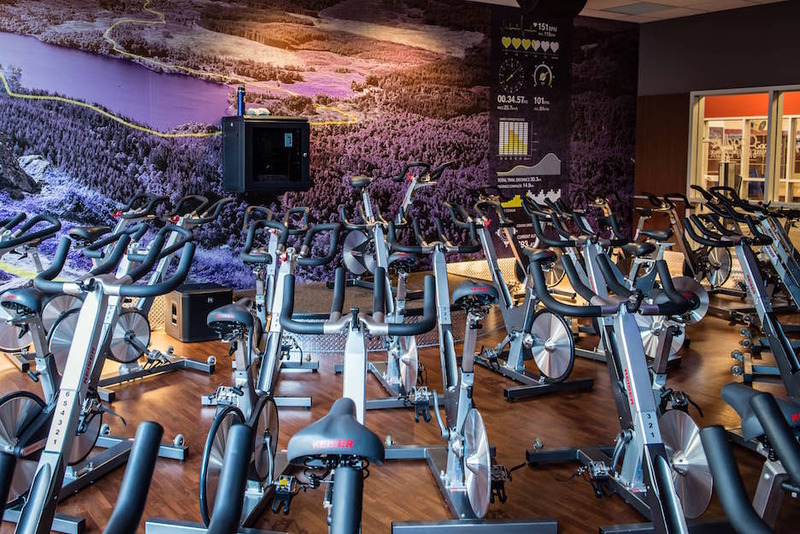 A sports fitness flooring installation at Hot Yoga in a Goodlife gym: rubber flooring in front and hardwood or hardwood-look LVT seen through front glass. A cycling room flooring installation in Toronto. A Goodlife gym cycling room with medium-dark hardwood or hardwood look LVT (luxury vinyl tile) flooring. 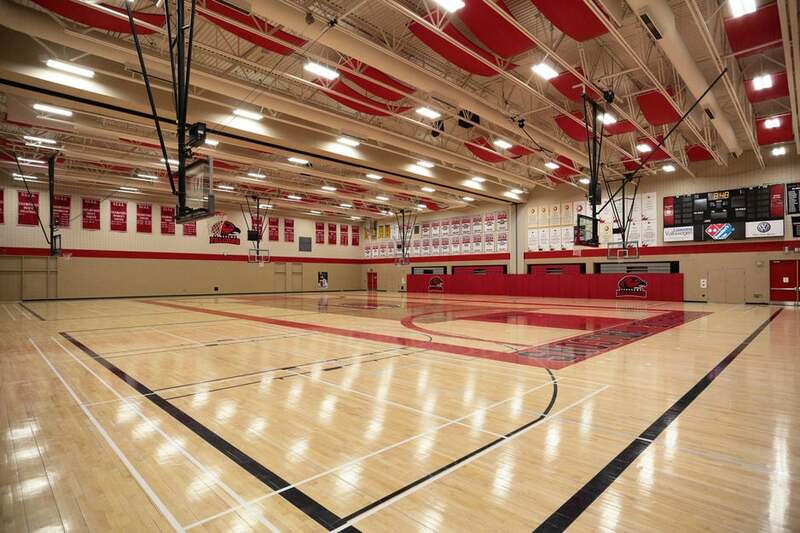 Gym flooring / court resurfacing project at Fanshawe College in London Ontario. 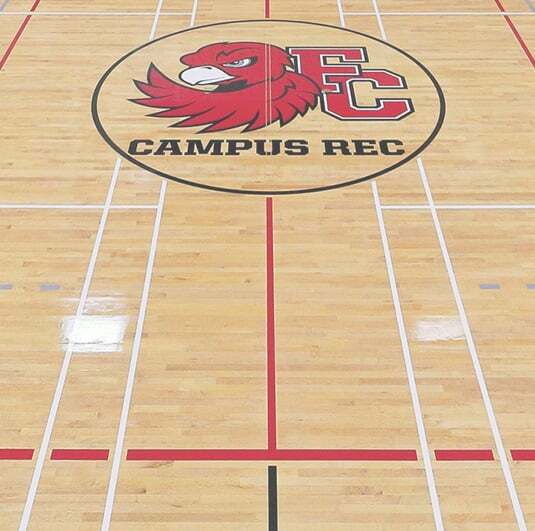 Gym hardwood floor sanding, staining and refinishing to rival the big leagues with painting and masking services for game line markings and custom graphic artwork logos, wordmarks, mascot incorporated into the gym floor finish - Fanshawe College Falcons mascot logo in the centre. A flooring installation project in Ontario. 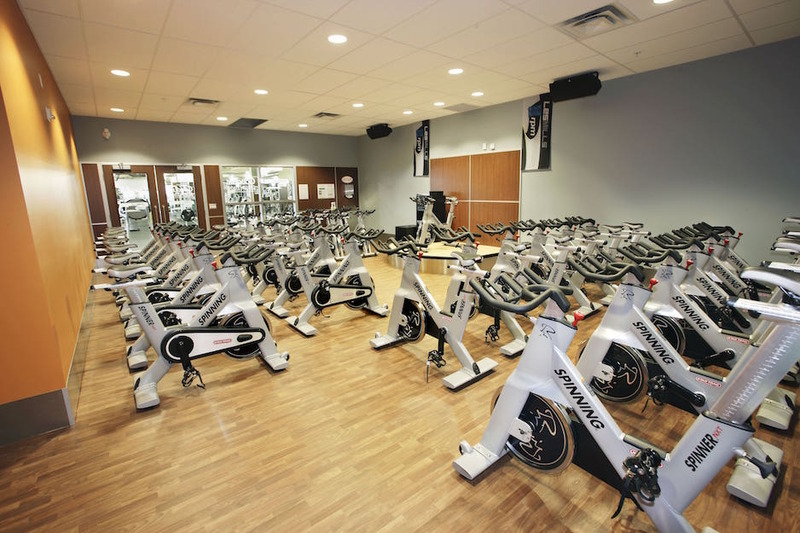 Goodlife gym spinning equipment room with light-coloured hardwood or hardwood look LVT (luxury vinyl tile) flooring. A rubber flooring installation project in Burlington Ontario. 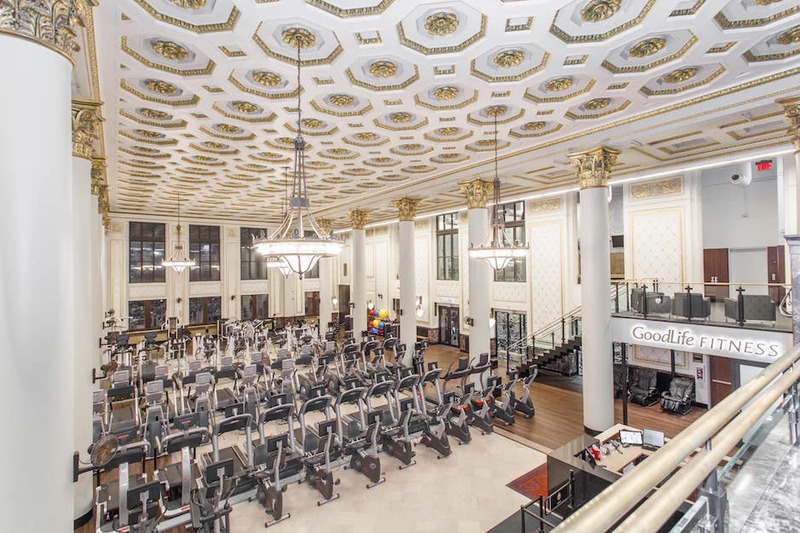 A rubber-floored Goodlife gym cardio room with a balcony above. High school gymnasium with hardwood flooring under construction. Gym hardwood installation project. High school gym being renovated with new light hardwood flooring. Gym hardwood floor installation project. 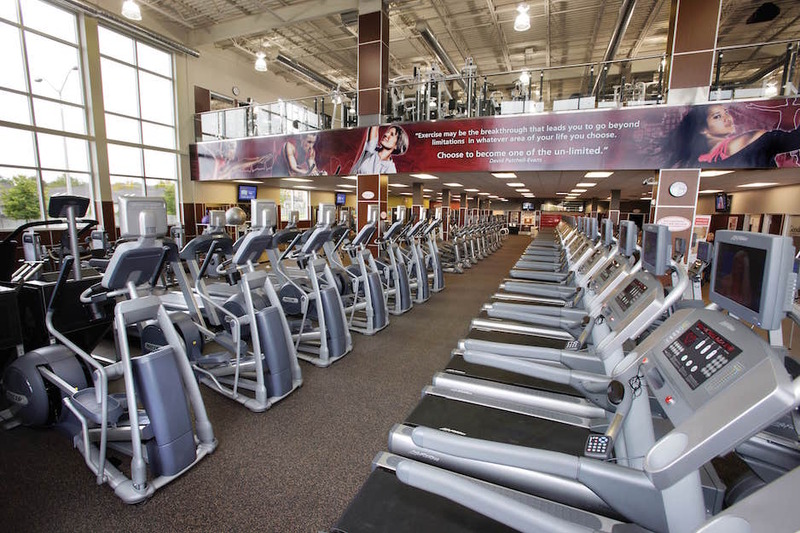 Gym cardio room rubber floor with treadmills and elliptical equipment. 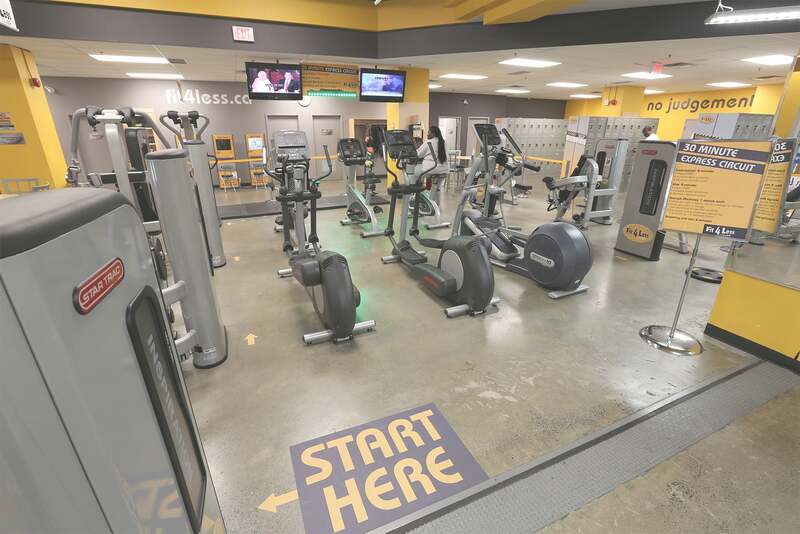 A fitness flooring / resilient flooring installation project. A squash court and court flooring installation project in London Ontario. Squash court room with hardwood floor, glass backwall, white ceiling and specially constructed walls with line graphic work. 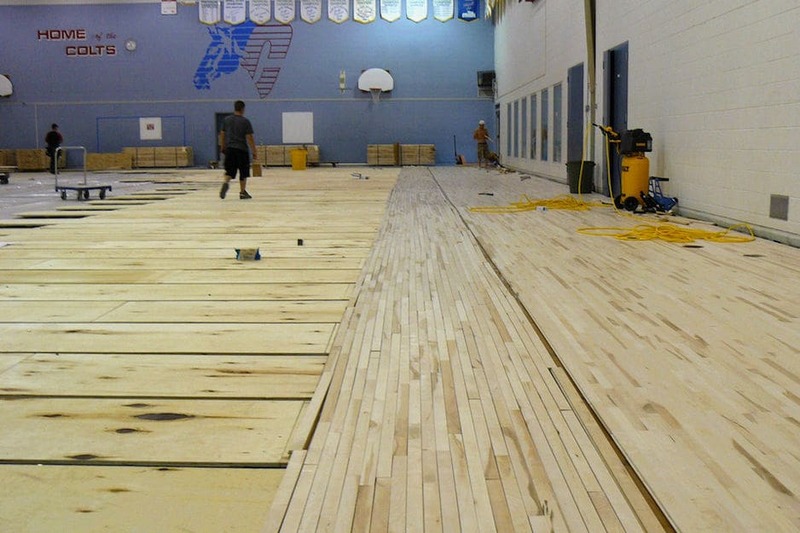 A squash court and court flooring installation project in Ontario. 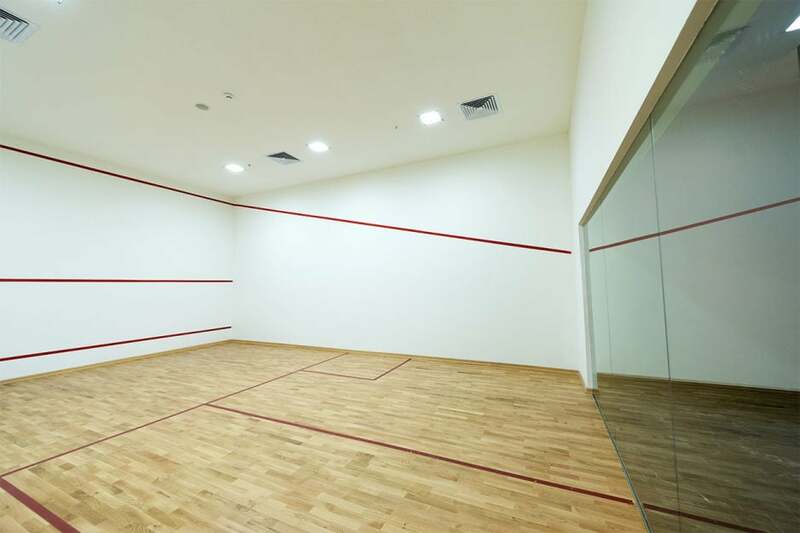 Squash court room with hardwood floor, glass backwall, specially constructed walls with line graphic work. A squash court and court flooring installation project in London Ontario. Squash court room with hardwood floor, glass wall with line graphic work. 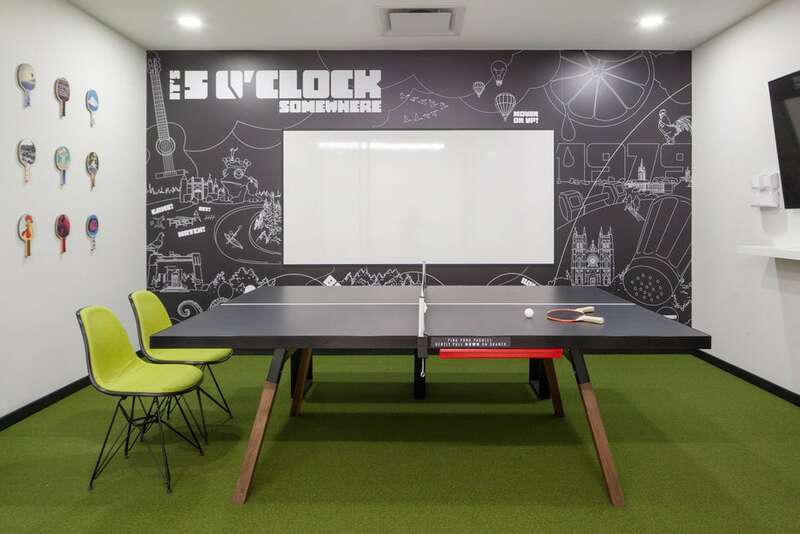 A green turf flooring installation project in a table tennis room of gym offices at Fit4Less gym in Ontario. 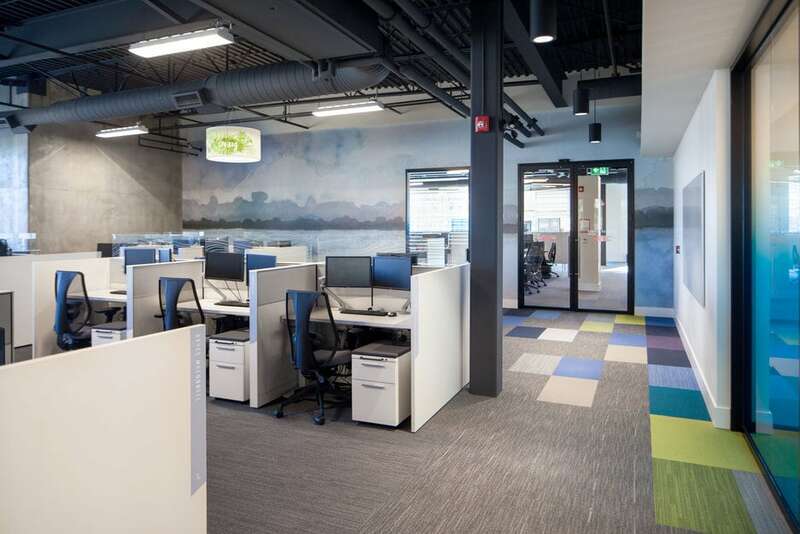 A custom cut mosaic of carpet tile / flooring installation at a fitness gym's computer room in Ontario. 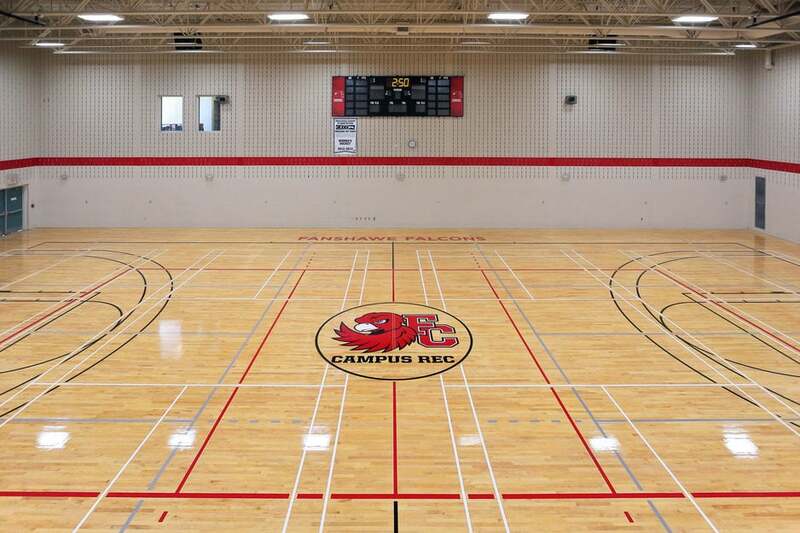 Gym flooring project at Fanshawe College in London Ontario. 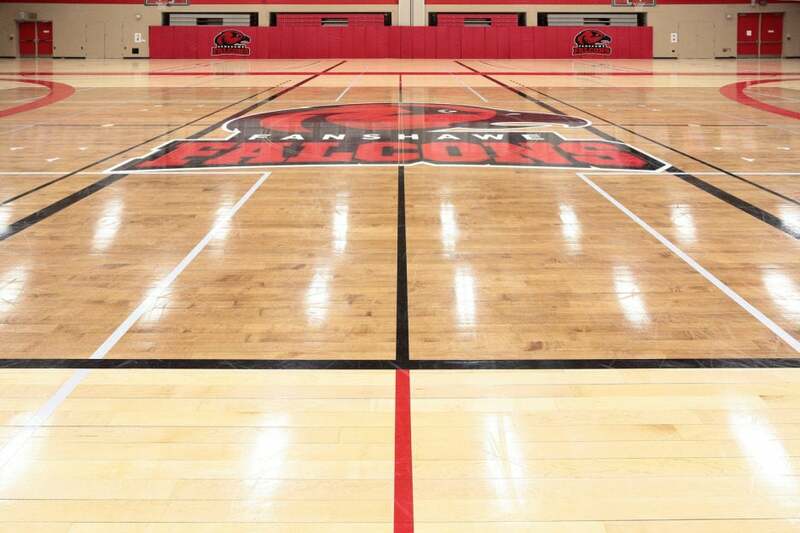 Gym hardwood floor sanding, staining and refinishing to rival the big leagues with painting and masking services for game line markings and custom graphic artwork logos, wordmarks, mascot incorporated into the gym floor finish - Fanshawe College Falcons mascot logo in the centre.